INDIANAPOLIS -- Nobody ever said they were perfect. Now, the Kentucky Wildcats aren't undefeated, either. The hard-nosed Wisconsin Badgers did what nobody else could Saturday night -- knocking off the Wildcats 71-64 behind 20 points and 11 rebounds from Frank Kaminsky and a clutch comeback down the stretch. Now, it's Wisconsin heading to the final to play Duke, an 81-61 winner over Michigan State in the earlier -- and much less entertaining -- semifinal. "It gives us another 40 minutes, I know that," said Wisconsin coach Bo Ryan, who leads the Badgers to their first final since 1941. And Kentucky has a long ride home, finishing the season at 38-1 -- two wins short of becoming the first undefeated team in college basketball since the 1975-76 Indiana Hoosiers. Instead, these NBA-ready group of Wildcats join the star-studded 1991 UNLV team as the latest to take an undefeated record into the Final Four but lose in the semifinals. So much has been made of Kentucky's unflappability when things don't look so good - like when the Wildcats got outplayed against Notre Dame last week but somehow pulled out a two-point win to make it to Indy. This time, though, it was Wisconsin that came up clutch. Trailing by four and gasping for breath after going 6 minutes without a bucket, the Badgers (36-3) responded with an 8-0 run to take a lead Kentucky couldn't overcome. Kaminsky and Bronson Koenig went 7 for 8 from the line over the last 24 seconds to seal the win. Kentucky's last, best chance came while trailing by three with 12 seconds left. But Karl-Anthony Towns received the ball in the post and got fouled. 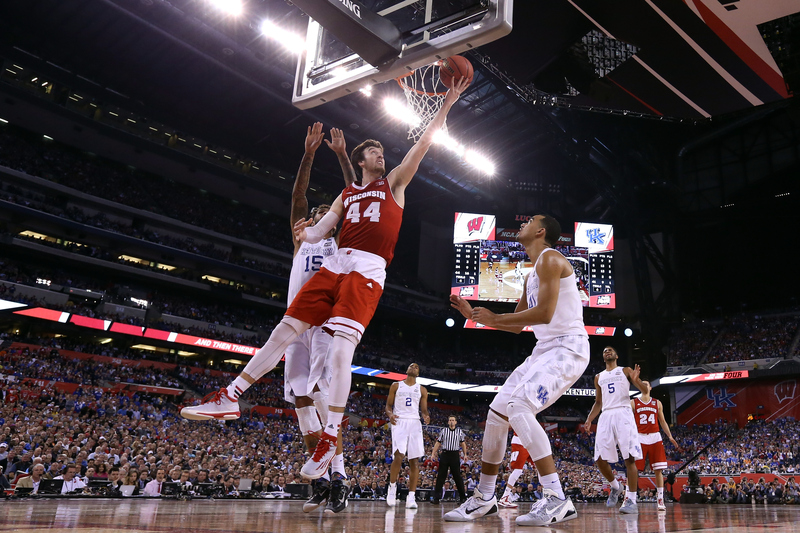 He made only one free throw, and from there, Wisconsin iced it from the line.